Yesterday was a busy day on the farm. We had hay feeders to fill, straw to place and 20 sheep to shear. Our shearer arrived, set up and got to work. We had penned the ewes in the barn the night before, so they were dry and close at hand. On the left is a picture of BFL Dougal. Our girls aren't due for another three weeks, at the earliest. Lambing will go until the end of May or early June. We intentionally bred a little later this year. We wanted to ensure that there was plenty of green grass for the ewes. It's tough to wait for our lambies when other shepherds are posting lamb pics all over their blogs! 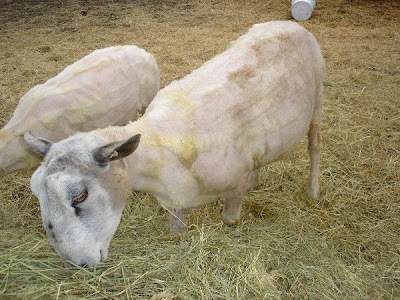 Below is a picture of a few of our girls after shearing. Overall, I was very happy with the condition of the sheep. 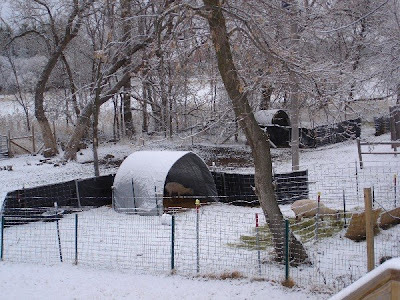 We have bought our hay from the same place the last two winters and the ewes have been in good condition in the spring. One less thing for this new shepherd to worry about! I will start graining the ewes though, as the lambs gain more weight during the last six weeks of gestation. Below is a picture of our two polled rams, Bluefaced Leicester Dougal (right) and BFL X NC Cheviot ram lamb Doogie. They look just fine after spending a few months with their girls! After all the barnyard work was done, I was rewarded with 20 colorful fleeces. While waiting for lambs to arrive, I can at least soothe my anxiety by playing with fleece, right? 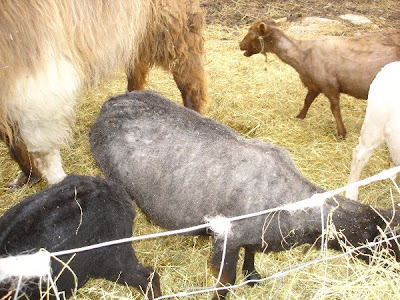 I have a nice variety this year - single and double coated Shetland in a variety of colors; a white Bluefaced Leicester fleece, white and black Mule sheep, a BFL X NC Cheviot, and two NC Cheviots. My goal is to produce fleeces for a variety of handspinners. To that end, I have crossbred most of our sheep this year with the BFL or BFL X NC Cheviot. I am hoping for purly or crimpy luster added to the Shetland color; and more crimp and luster added to the NC Cheviot. I have much work to do with skirting. I will have a booth at Llama Magic this year on Mother's Day weekend, May 9th & 10th. Llama Magic takes place at the same time/place as Shepherd's Harvest in Lake Elmo, MN. I placed a link on the sidebar for you to check it out! I will post pictures of the fleeces as I skirt them. 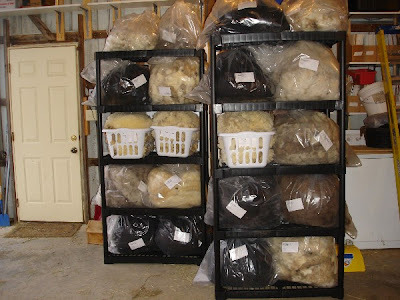 Most fleeces are available for sale. Call or email for more info. And, of course, there was snow on the ground this morning! But it is now 1pm and the snow is already melted. Is it really spring? Thanks for looking! And thanks for the heads up on the email. I added it under profile. Thanks again.